If you are like most Americans making the rent each month is a game of chance. I spoke with a Teacher whose first pay check is the rent the rest is for utilities, food, gas and other costs. 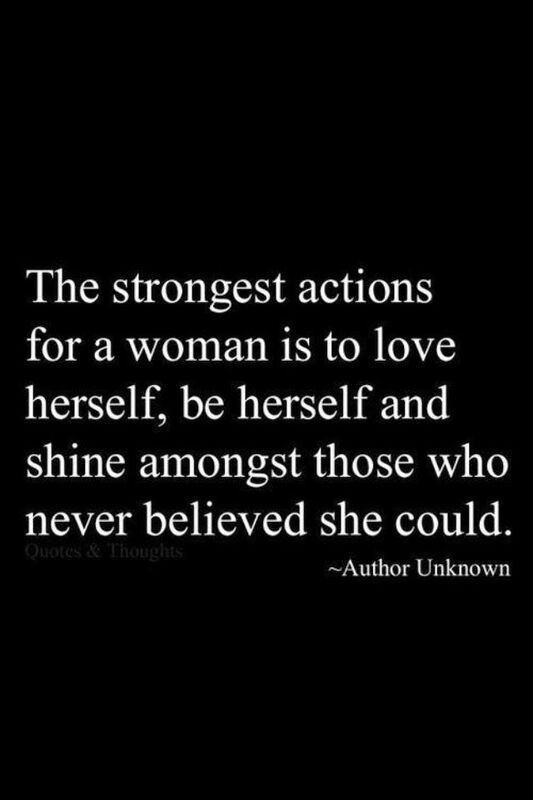 In other words - hand to mouth. You would have to earn $17.14 an hour, on average, to be able to afford a modest one-bedroom apartment without having to spend more than 30 percent of your income on housing, a common budgeting standard. 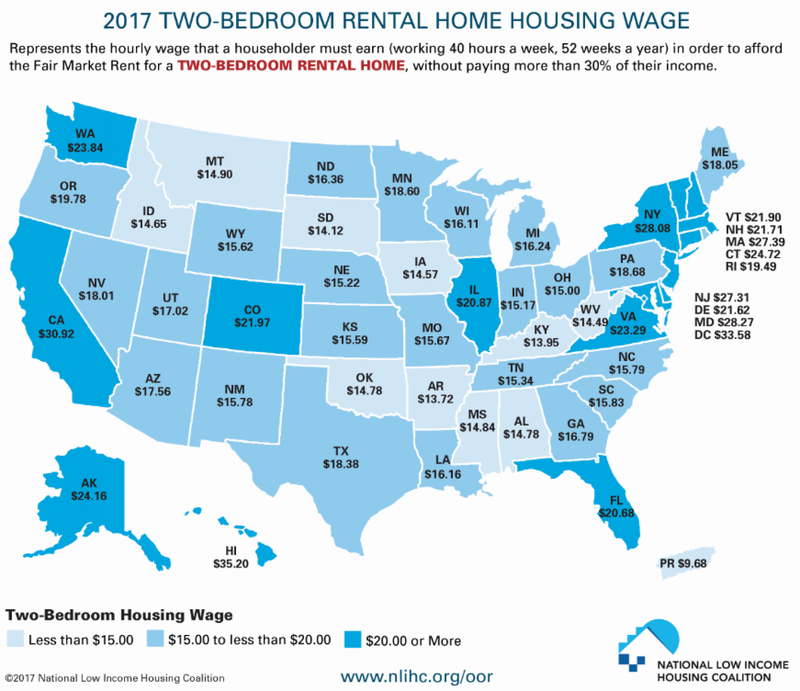 Make that $21.21 for a two-bedroom home -- nearly three times the federal minimum wage of $7.25. "The gap between wages and rent is growing," said Diane Yentel, president and CEO of the Washington-based National Low Income Housing Coalition, which has conducted similar analyses for 28 years. "There's no doubt that the affordable housing crisis overall has increased since the foreclosure crisis in 2007." The report details how much a household must earn to be able to afford rent in every metropolitan area and county in the country. 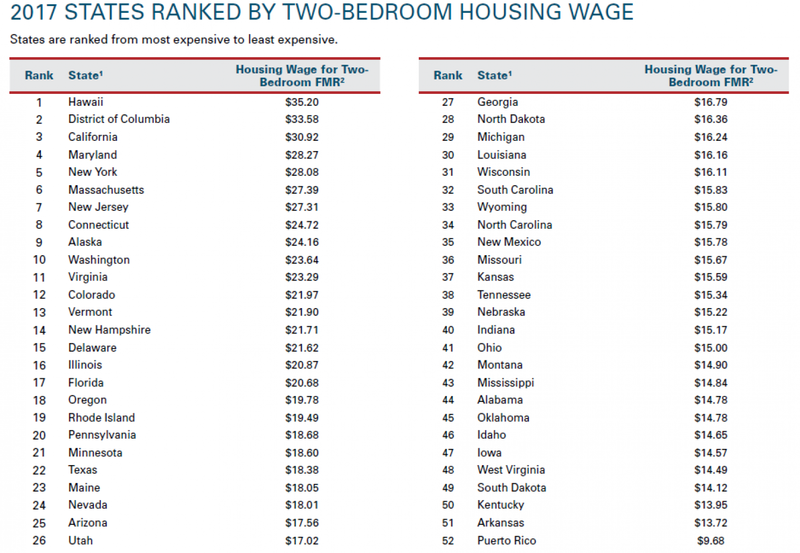 Renters in the U.S. make, on average, $16.38 an hour. 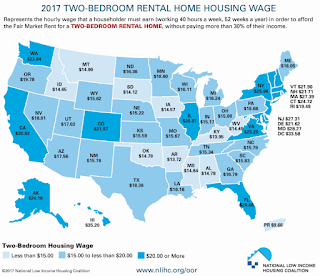 The minimum hourly wage required to afford rent on a two-bedroom apartment, of course, depends on where you live -- ranging from a low of $11.46 in some counties in Georgia to a high of $58.04 in the San Francisco Bay Area. 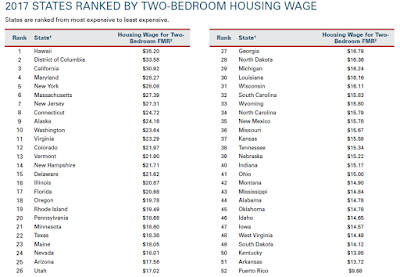 The most expensive state for housing is Hawaii, where workers would need to make $35.20 an hour to afford a two-bedroom apartment. They would need to make $33.58 in the District of Columbia, $30.92 in California, $28.27 in Maryland, and $28.08 in New York. In the District, where the hourly minimum wage is $12.50, a household -- say a single parent -- must earn $69,840 a year to be able to afford the fair market rent of $1,746 a month for a two-bedroom apartment. Someone making the federal minimum wage would need to work 117 hours a week -- or nearly three full-time jobs -- to be able to afford a two-bedroom apartment. Many of the occupations projected to add the most jobs by 2024 pay too little to cover rent. These are customer service representatives, personal care aides, nursing assistants, home health aides, retail salespeople, home health and food service workers who make, on average, between $10 and $16 an hour. As a result, more than 11.2 million families end up spending more than half their paychecks on housing, the report said -- a trade-off with other basic needs like food, transportation and medical care. U.S. Rep. Keith Ellison (D-MN), in a conference call with reporters Thursday, called the disparity between wages and rent in the wealthiest country in the world "unconscionable." The lack of affordable housing has long-term consequences for families, he said, making it difficult for children to stay healthy and do well in school. The report comes at a time when programs for low-income Americans, including subsidized housing, are increasingly under threat. The current level of public subsidies is already not enough to meet the needs of low-income families, with only one in four eligible households able to receive assistance, the report said. Federal funding for housing assistance programs has declined by 3 percent between 2010 and 2017, the report said. President Trump, in his budget plan for the 2018 fiscal year, recently proposed $6.2 billion in cuts to the Department of Housing and Urban Development, the most dramatic reduction to the agency since President Ronald Reagan slashed its funding by 50 percent in the early 1980s. Trump’s proposal would gut federal funding for affordable housing, along with other programs designed to serve the poor. The National Low Income Housing Coalition characterized the lack of affordable rental housing as a national crisis for poor and middle class Americans of all ethnic groups, in cities as well as rural communities. Ellison has sponsored a bill that would reduce the popular mortgage interest deduction, which benefits mostly high-income earners, and use the additional tax revenue to expand access to rental homes. Each year, he said, three-quarters of the $200 billion Congress spends on housing goes towards subsidizing the homes of the richest families through the mortgage interest deduction and other home-ownership tax benefits. "For decades, politicians were told that the mortgage interest deduction was something you just couldn't talk about. It was the so-called third rail, and if you messed with it, you were going to be electrocuted," Ellison said. "I actually think we should be directing our housing expenditures to people who need it the most." This is the third time Ellison has proposed reducing the mortgage interest deduction. His previous attempts have all failed.